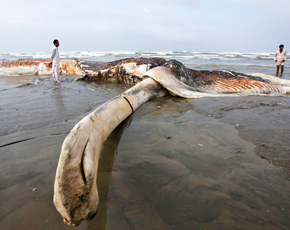 The 69-foot long body of a blue whale washed up on the Sea view beach in Karachi on Wednesday. No preliminary post-mortem examination was carried out to determine the cause of it’s death. Hence, if there was a hazardous environmental factor that contributed to the whale’s death, and may as well be threatening other marine life, it remains uninvestigated. What’s even more harrowing about the tragedy is that the Cantonment Board Clifton let the corpse go to waste by not preserving its skeleton for educational and research purposes. Instead, the only viable solution was to chop of the whale’s decomposing body and dump it in open plots in Phase VIII of the Defence Housing Authority. The Sindh Wildlife Department washed its hands clean of the mess by providing no guidelines. Because the skeleton was not complete, the department did not think it was necessary to preserve or study it. If the whole world went by this mentality – there would probably be million of fossils discarded today instead of being displayed in various museums around the world! One wonders why we’ve even bothered to keep appearances by having wildlife departments – perhaps they have bigger fish to fry? Dawn.com invites its readers to give their view and suggestions on how we can make an effort to preserve, protect and study the wildlife and marine animals our land and oceans are full of. I feel really bad after watching people dancing on the dead body of this mammal. I am very excited about it but no further details was available about the big giant.It would be the irresponsibility of the department to look into the matter and efforts be made to preserve its parts so that the knowledge about the sea animals living in our sea can be shared with the rest of the world. There is nothing much to learn about the skeleton of a whale. If the bones are preserved in a museum you can expect more revenue from the ticket collection. 69 feet is awesome ! Only this is the biggest factor which is contributing in our downfall as a nation. None of us feels about his responsibility and remain unknown from the relevant duties. Not everything is a government responsibility guys. Volunteers, activists and enhusiast should have the will to do what they believe in. Edhi foundation, Citizens Foundation, etc. are example of what people can achieve if they put their minds to it. In Australia we have seen increasing numbers of whales wash up dead, but this is thought to be due to the fact that as most whaling has stopped their numbers are increasing so we are just seeing the natural deaths more often. From what I read in the original article about this whale most of the head was missing and only part of the lower jaw remained. This would not make such a good example to display. And stripping a full whale carcass is not something you do lightly it is a BIG and expensive task. Even if you just pull the whale onto solid ground and let it decay can take months. I work for an environmental department here in Australia and our policy is to bury the whale if its in our parks. If its on government beach than they have to bury it for health reasons. I do think having a whale skeleton is a good draw card for museums but it has to be big and complete. I am sure if the museums of Pakistan put out a call to other world museums for material you may be able to find one that has a spare to donate. No preliminary post-mortem examination is another thing but our universities or collages also did show interest to examine for research for the knowledge of students , may be because of Karachi situation or lack of funds or they just lost interest in education. Good point made in this article. In my view, the responsibility should lie with Sindh Wildlife Board. However, they would argue that since the animal was already dead, they are not responsible. Fair enough but they are responsible for all living animals and therefore they are duty bound to find the causes of death of this animal, as pointed out in article and elsewhere. But getting the skeleton together for education purposes should have been up to Natural History Museum and whatever ministry they fall under. Cantonment Board Clifton undertook chopping and disposal of the carcass to prevent the spread of disease. But spreading it around open plots, who came up with that idea ? Wasn’t this going to increase the risk of spreading disease ? The fault lies not only with system but sub standard and mediocre staff (and this includes senior maangement/director/chairman etc.) who attain positions of power where they have no knowledge or motivation to do anything beyond the ritual daily tea drinking, reading newspapers and discussing politics. We can disband these and other government departments, savings crores of rupees without an iota of impact on our environment simply because they don’t do anything in first place. I personally think in a bigger picture this is merely a drop in series of incompetency whether its the Cantonment Board Clifton, wildlife departments or any part of the system if you choose. Having said that, it much easy to watch/read this and point fingers. I think the blame goes to me, you and every other pakistani enduring under such atrocities, some of which has been summarized above as well as repeatedly through various media. Yet has been all talk. so unless I do something, even as little as awareness or lack of neglect within my household (specially a call to people who still have a shred of morality and are in a capacity to make changes) nothing will change. Universities should come forward for research purposes. I am just wondering. Do we really have a wildlife department? If it does, i am pretty sure the staff over there has no sense of wildlife and environmental matter. This was Natures gift but we lost this oppertunity. Preservation of the SKELETON is not difficult but who will take responsibility in Pakistan ! It is criminal act on the part of all responsible not to preserve the remains of the blue whale. In a system which is characterized by accumulation of wealth in few hands at the cost of whole lot, our so called authorities found no monetary benefit in doing a cumbersome exercise to save the skeleton. Had there been a market available to earn huge amount of money by selling its skeleton corporations, business tycoons, military high-ups, bureaucrats, landlords, land mafia and political parties would have rushed to grab this opportunity. Fault is with the system based on exploitation. Very well said, Mr. Javed Ahmed. The only question rise here is that who will start owing responsibility, whether Cantonment Board Clifton or the members of wildlife departments or common citizen or a writer of this blog who really think that we could have preserved skeleton for our future generation to feel pride about marine visitors near Clifton. It just like no body bothers to really work for the department they are associated with….. Such a short and concise litle piece of writing, yet well done. I’m not sure about the term ‘hazardous environmental factors’, a tad extreme. However, having said that it is concerning our wildlife department just baically said, “Forget it, can’t be bothered.”!